Best known for his roles in Mystic Pizza, Highway to Hell, and The Stand, Adam Storke seemed an actor on the cusp of breaking out. 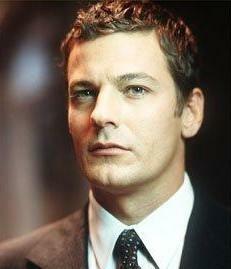 Throughout the 90's he guest starred in many television series and even starred in the short lived "Prey" in 1998. But then things seemed to slow down for awhile. Years passed between appearances on TV. During this period he briefly dated Natasha Gregson Wagner, step daughter of Robert Wagner, Adam's godfather. So where is he Non? In the fall of '99, Adam was in an accident. Heading home late one night, he was T-boned by an 18 wheeler carrying a load of toxic waste. The resulting radiation made him sick for a time, but inevitably gave him superpowers. With his sudden abilities to fly, stretch, shoot lasers from his eyes, and turn into a lamp, Adam understandably decided it would be best to keep a low profile. So while it's great to see him on the occasional show, it's better knowing he's out there fighting for truth, justice, and soft pretzels. Soft pretzels are worth fighting for. Good to know he's been busy with worthy causes. Thanks for the update. Now where's my soft pretzel? That totally changed direction on me! I'd never in my life had a soft pretzel until I moved to the U.S. Sheltered. That's good coz before I read this I would have had to say, "who the hell is Adam Storke"? I wish I could shoot lasers from my eyes. The ability to turn into a lamp? Glad to hear of a super power that is actually worth something. Yeah, I agree with Cotton. Flying, stretching, and shooting lasers, just draws attention to yourself. What ever happened to superheroes going incognito? Turning into a lamp would be much more useful. The question that remains, however, is does he have the power to turn on and off. Because looking like a lamp is one thing. BEING a lamp is a whole ballgame of a different color. I think he might be pretending to be one of my lamps in my living room. It's always looking at me funny. Welcome to the club, PowderedToastMan! Rep, I THOUGHT THE SAME THING! But I found it embarrassing to admit that I actually spent time wondering if he had to be plugged in, what kind of 'on' switch he might have...is he using a spiral CFL (surely!) and is he equipped with a clapper? So glad I'm not the only one throwing horseshoes at the ol' ball game. Why are you throwing horseshoes at a ball game? You could hit someone. He plays the lamp on How I Met Your Mother! He's now the second highest paid actor on television, behind Charlie Sheen.... He's very good.... He light's up the screen every time you see him!